3rd August 2018 – There were three PACE athletes competing at the African T&F Championships in Asaba, Nigeria, and between them they brought back three medals. Former World Junior silver medallist over 800m Winny Chebet (KEN) stepped up to the 1500m last season and she won her first major senior title over that distance here. 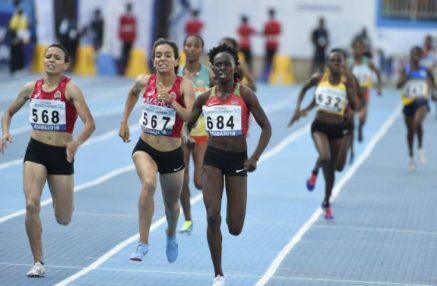 A strong move to the head of the field with 300m remaining showed Winny’s intent and she fought hard all the way to the line to hold of the challenge from the Moroccan duo who were also finishing fast. Just a tenth of a second separated them at the finish but Winny was the one topping the podium. Winny took the title from Hellen Obiri (KEN) who won the 1500m at these Championships in 2014. On this occasion Hellen was contesting the 5000m and she added yet another medal to her ever growing collection. Easing away over the final 2km Hellen wound up the pace to eventually take victory by over 10 seconds. This result means Hellen is current World Champion, Commonwealth Champion, African Champion and Diamond League Champion over the 5000m distance, as well as the Olympic silver medallist. To date Timothy Toroitich (UGA) had been known as more of a cross-country specialist with multiple victories across Europe as well as top 10 finishes at the IAAF World Cross-Country Championships. However, he was able to take his first major track medal here by claiming bronze in the men’s 10,000m.